Beautiful shots and magnificent glass art! 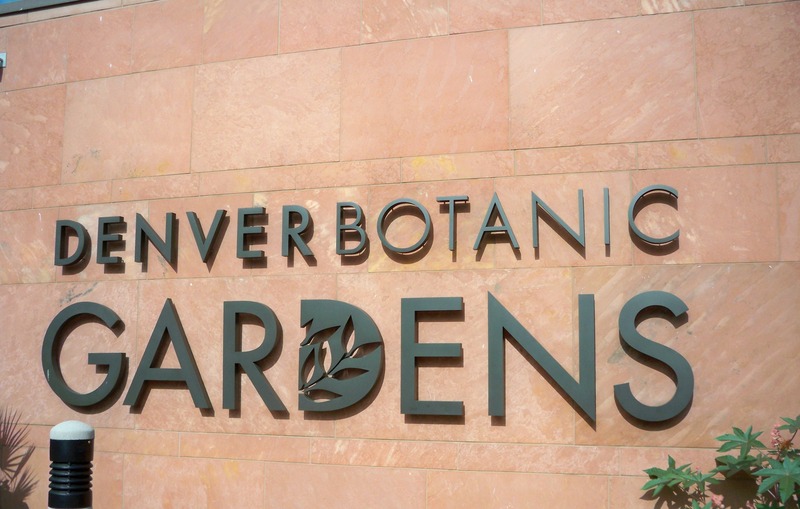 Throughout the many years we’ve lived in Colorado, I’ve often thought of going to the Botanic gardens, but haven’t yet. These photos have given me a little more reason to visit. Thank you for posting these. Thanks! The gardens have been renovated over the last few years, and they are really spectacular with all the rain this year. 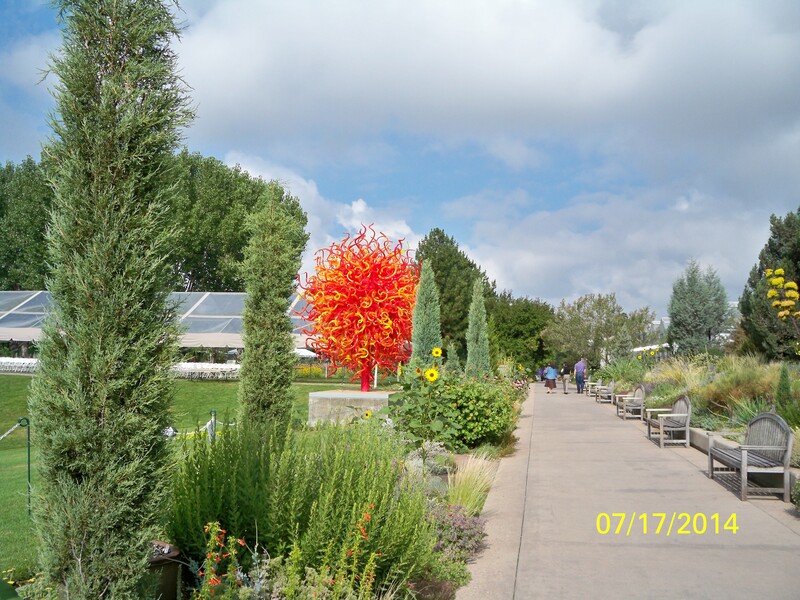 If you go, best to get there at opening because the Chihuly exhibit is so popular that parking and crowds are more of an issue than in “normal” summers. The gardens are beautiful any season really. Thanks, Lainey. I first “met” his work in an art gallery near home when I lived in urban Denver. He has unbelievably gorgeous chandeliers; I used to pop in there all the time! How wonderful, I’m a bit envious. Would love to see his work up close! Just beautiful and heart warming! O the creations are so wondrous! 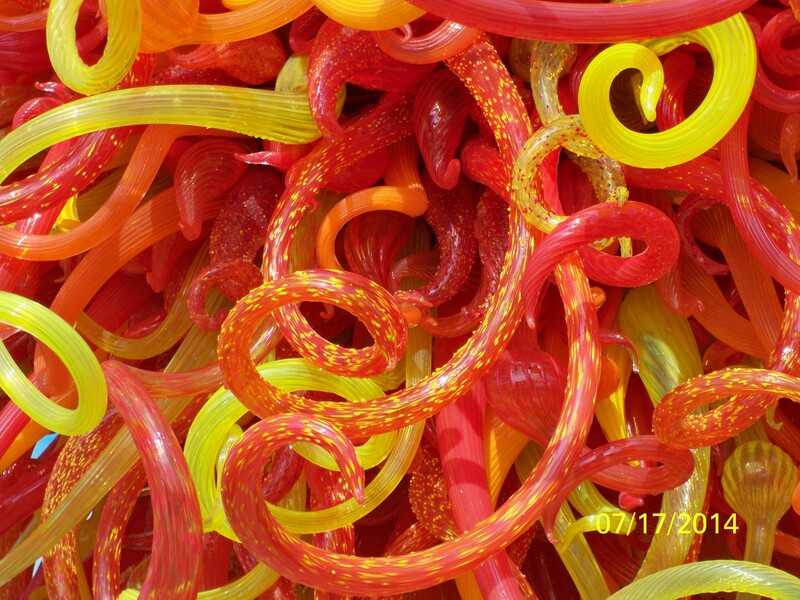 They are all exceptional and I agree about the orange twisty ones reminding of Medusa’s hair. Thank you for sharing these Sammy! Thanks, Susan. Wouldn’t it be fun to visit his studio? I’m going to search for an online interview – I’m always curious about what they are thinking and what inspires their work. As a lover of all things resembling mid century modern, I say thank you for these pics which remind me of Venini and other Murano masters. Thank you, Elisabeth. Great artists indeed! Thanks! I’ve only seen a few of his works before. 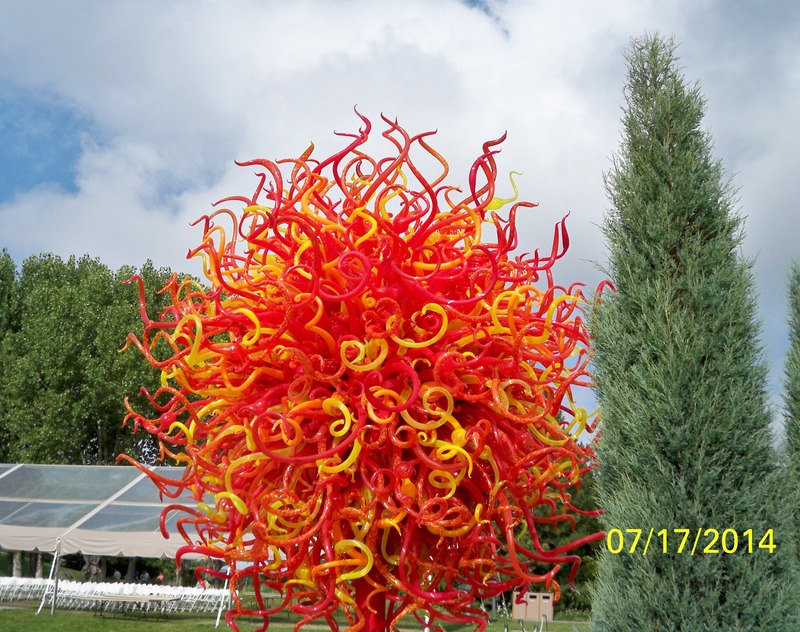 Oh Sammy, I just love chihuly’s glass. His from this neck of the woods, so he is very well known around here. His thought process amazes me and his colors are so vibrant. Of course he is getting old like the rest of us and the strong young people do most of his hard work and he supervises. I am always amazed how the sculptures are fitted together as well, and transported. Lots and lots of work for such a traveling show. You are so right – the “behind-the-scenes logistics on packing, transporting and location-specifics have to be mind-boggling. I watched a Garden volunteer working among the spikes and spirals of one of his pieces, trimming the surrounding plants leaf by leaf. She was about our age, and I told her I would be terrified with my sometimes tipsy balance to work so closely to his pieces. She said she was feeling the same way – on pins and needles and praying she didn’t misstep! I couldn’t believe they let “ordinary” volunteers work so close to the art! hope it is there when I get back! You’re back before the end if Nov, right? Might be nippy camping then! My comment to you didn’t go through a couple days ago – loved your rendition of the devil mattress and gift to the Baptists. Today’s post was lovely, too. Weren’t you tempted to stay there a couple more days with your chairs so perfectly placed? I love his work and look forward to seeing what you come up with over the next few months. 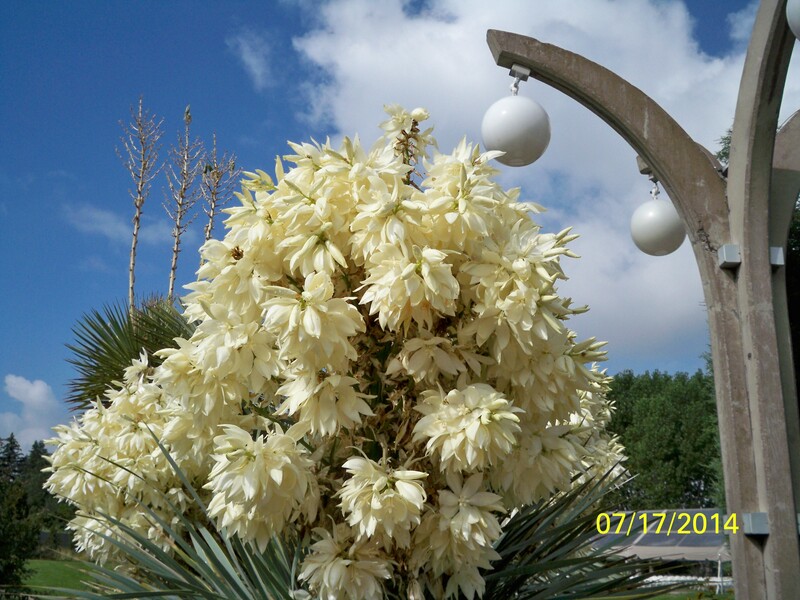 The purple spikes are gorgeous (well, they are purple 😉 ) but I also like your flowering yucca – how lovely is that! Aren’t they gorgeous? The color and reflection on the water were stunning. It was very interesting to see how some colors drew me in and others pushed back. WOW! WOWOWOWOW! Never even heard of him! Wow! I love the bottom pic with the pink and white. Thanks for stopping by! I’d like to get a photo of that one again when there’s more contrast in the background. Got here at last, Sammy 🙂 I love Chihuly’s work too. You know I won’t be hurt if you don’t swing by. I know you’re here in spirit :-). But thanks! Bemuzin knocked my socks off with her blog about this glass artist. 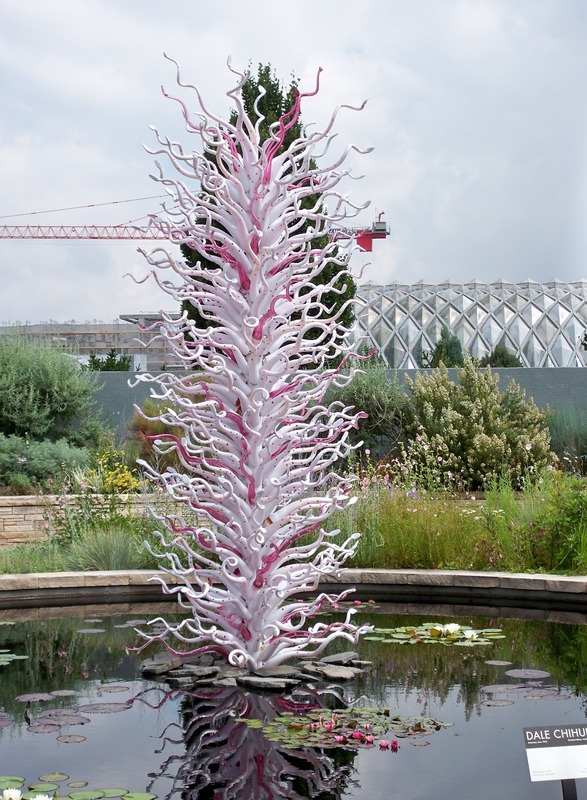 I never heard of Dale Chihuly. Sammy took some great pictures! 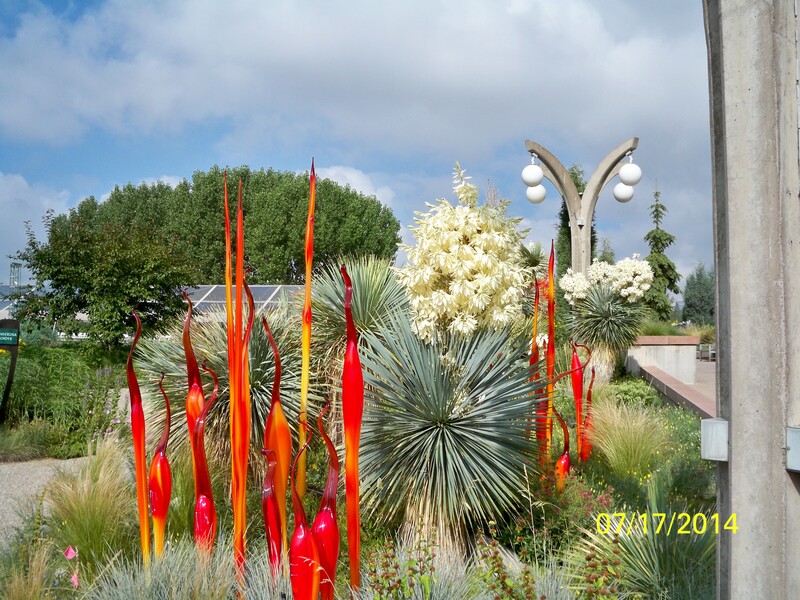 Thanks for sharing the Chihuly glass (and including the links). Truly amazing. Can’t wait to see how the scenery changes through the seasons to enhance the pieces. Spectacular. You’re so lucky to have seen and photographed these firsthand. I’ve seen similar open air glass exhibits in Japan, but nowhere near this gorgeous. Thank you, Damyanti. I am always taken aback when I realize the physicality required of artist -whether it’s the stamina and dexterity to hold the pen or paintbrush to the ability to withstand the heat of kilns and ovens – art asks as much of our bodies as it does of our minds. So glad you shared these, it’s actually given me an idea for a particular scene in my book where I was a little stuck – goes to show just how you can never know where inspiration will come from! Haha, next time I’ll shout DUCK!! before throwing it back. Exactly right, ideas come at you from everywhere if you’re open minded – but also I’ve that if in the back of your mind you are thinking about whatever it is that you need help with. I read something about that (going to blog about it too, whenever I get the time), and it’s true the more you are thinking about something the more inspiration you get when you’re not expecting it! Absolutely gorgeous! How clever to mix glass sculptures with live plants. Must be spectacular in person. Cheers! Yes, I’m very lucky to have this spectacular melding of glass and flora in my “backyard”. I hope you have a great weekend, and thank you again for being so supportive. Wow!! Awesome photos, we are definitely going to go see this; I’ve always wanted to see his work in person. My brother saw an exhibition in Dallas a couple years back and still talks about it. I hope we can figure out how to fit it in before the “big trip” which is approaching very quickly! 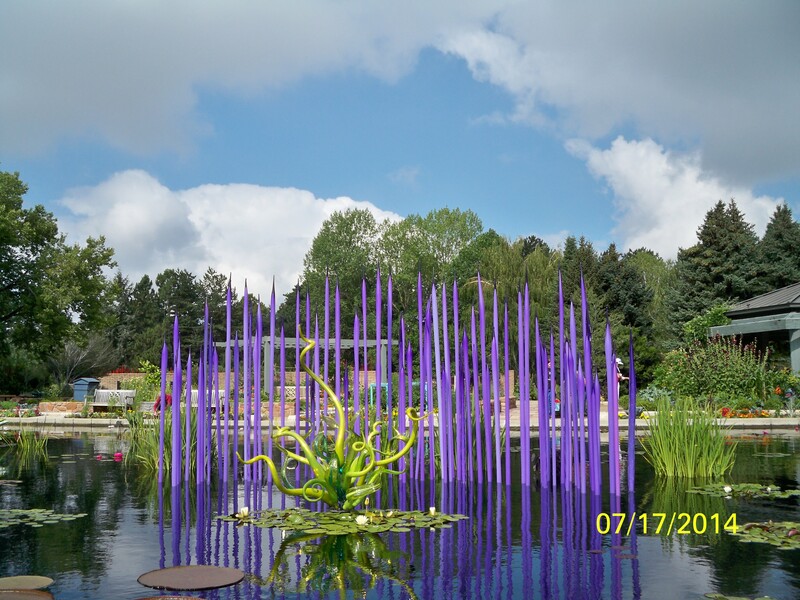 I got a thing in the mail saying that we can get a discount on the tickets with our DAM membership 🙂 I love the Botanical Gardens in Denver, we went there several months ago and had a great time. Thanks for sharing your photos of this special exhibition! They have a real parking problem because of big crowds. The structure fills quickly and surrounding streets are permit parking. My advice – week day if possible. Arrive around 8:40 when you’ll still find parking in structure, for 9am opening, which also means the gardens are relatively un crowded and you have best views. And now I’M the one up late! The perfect opportunity for me to catch up on what I missed when internet connections were either nonexistent or unreliable. I LOVE the exhibit and am only sorry that I wont be able to fit in a trip to see them “live”! Your idea to visit at different times over the coming month is a great one. I look forward to the posts. I’m looking the artist up to see if he is scheduled to come to the east coast any time soon right after I post this comment. Thanks, Shelley. 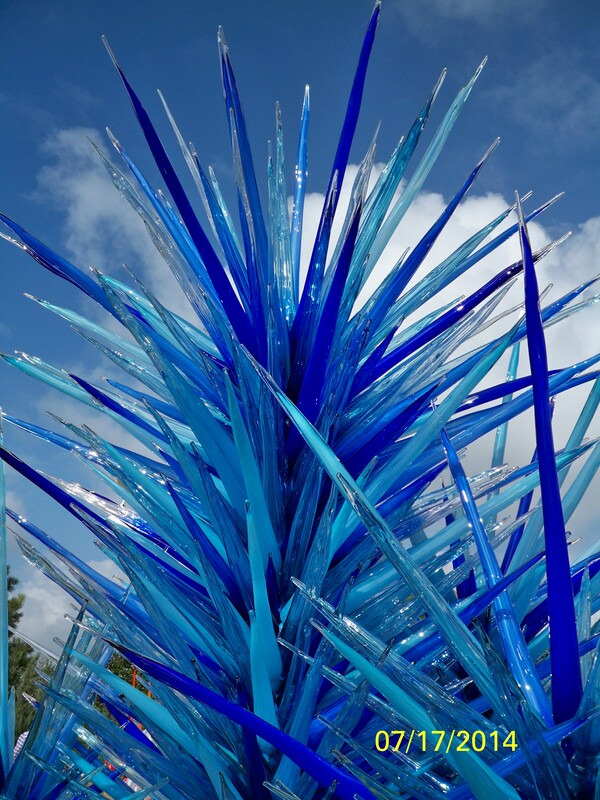 I do hope you can find a gallery or place to see some of Chihuly’s pieces, but his website does have very lifelike images.